From what I have gathered, and from what I have observed, most horses are kept in a stable, or barn, when they are not out in the pasture. But not all of them! 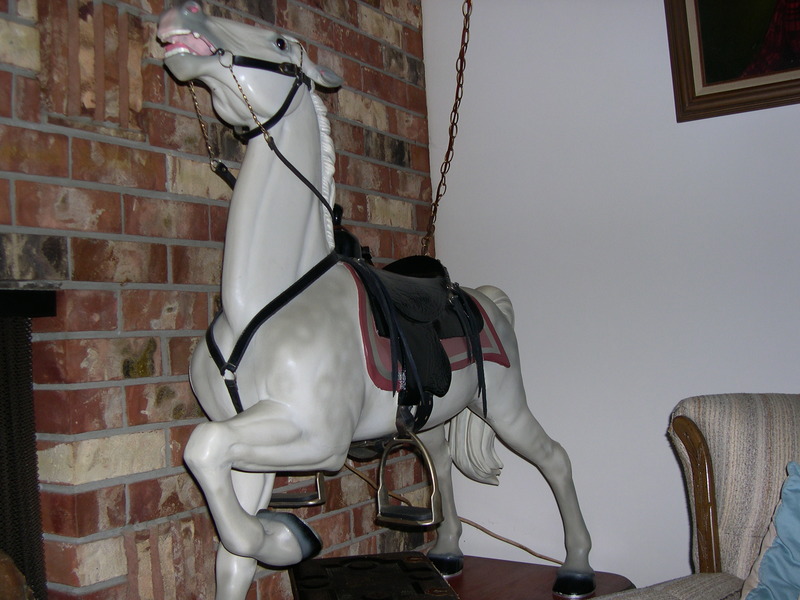 When we lived in Langley we had two horses, but no stable or pasture, for that matter… so the horses lived in our house. You guessed it… they weren’t the real thing. But pretty close, as you will see. My husband loved to carve. … and while we were still living in Vancouver where he had a basement to work in, that’s where he spent a lot of his spare time. He loved to carve horses. 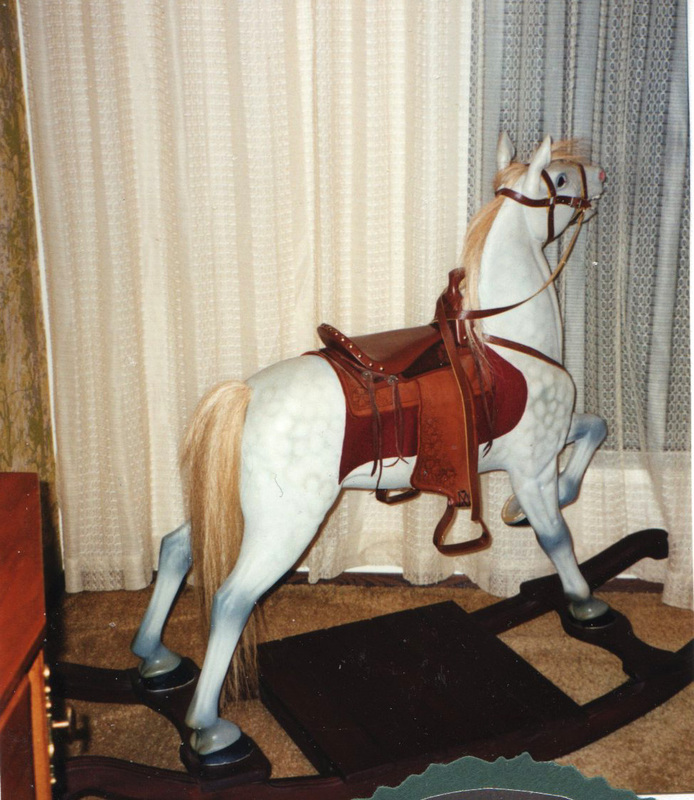 We had a rocking horse in our dining room, which I showed you before. Here it is again so I can answer a couple of questions that arose. 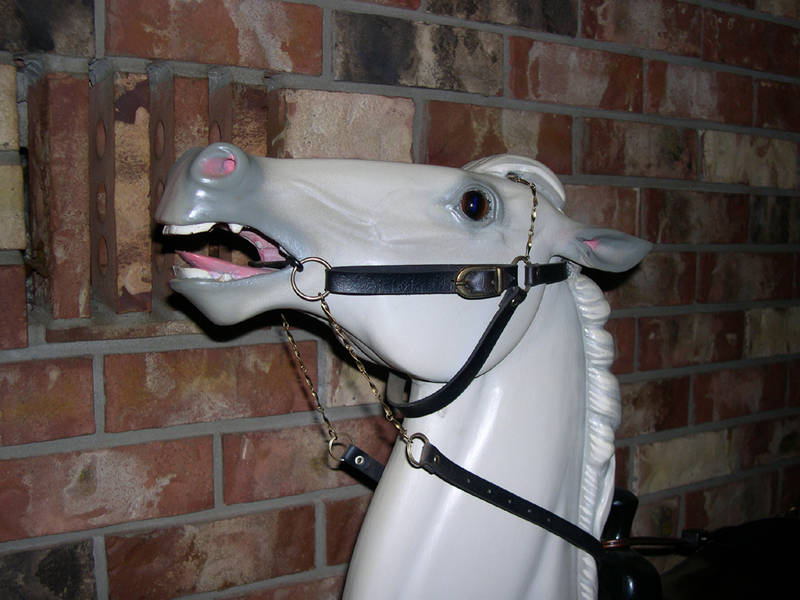 The saddle was removable. He made it separately from the rest of the carving. The tail? That was the real thing! We went to Abbotsford to a place that “put them down” ( sounds better than the real name of the place) and bought it… and washed, and washed and washed it. That was a very big job for my husband! We had another horse in the living room. This one is all carved. Horse, tail, mane, saddle, bridle, all in one! On another post I will show you some of the rocking horses he made… one for each of our three families. When I saw these photos this morning, I thought how wonderful a merry-go-round of these hand crafted horses would be! Good morning Heather! Thanks for stopping by and for your comment. I’ll pour your tea so we can have a little visit. 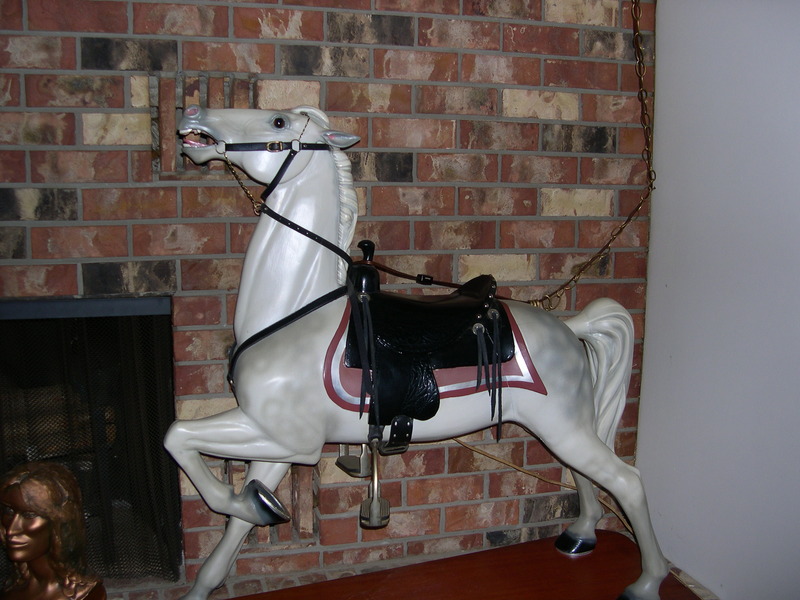 These were more Carousel horses than just a rocking horse, but they were used to give some kids a ride. Beautiful horses your husband carved Norma.His work is just wonderful! Lucky are the family members who have one of these beautiful horses.Have a wonderful day Norma & thanks for the cup of tea.I thoroughly enjoyed my visit with you.Keep shining! Good morning Dianne. I thoroughly enjoy your visits, too. Great to have a cup of tea and sometimes a cookie or two with a friend. Yes, my husband was very talented, and he loved carving. And blessings to you, too, Carol Ann. I do appreciate your visits and comments. I hope you enjoy the tea and cookies, and will be back soon for another visit! They’re magnificent! I remember these… but what I don’t remember is what looks like another bronze bust there on the hearth. That’s not the same one you wrote about before (http://wp.me/p22ctc-85), is it? Hi Carol! You are very observant… that bust was made at the art school when Gary and his Dad participated in a class. A first attempt… I think it was Mickey’s… and I think he was doing Sacajawea (spelling). You will probably know who I mean, even if I can’t spell it. She helped the Lewis and Clarke expedition, I think! I poured your tea, so we can sit for a bit. I have a hymn sing to go to later this afternoon.